Could you please give me your personal opinion about my character, Gath? Last edited by Xildur; 03-06-2017 at 01:36 AM. At first glance I think that Force of Personality is overpowered. In 3.5 you could use Charisma in place of Wisdom on Will saves, but this one allows for the combination. That seems like a good opportunity for cheese and I am inclined to nerf it. Was Warlord from the Path of War series? Also, what kind of elf are you? Have you checked out the Races of Ibinel? I just got home from table top. I will get to this in more detail tomorrow. Yes, it is coming from Warlord from Path of War. I have already checked the Race of Ibinel and I have chosen Sun Elf as my character's race. Coming from the Path of War, thats the least amount of cheese you have to worry about. Gath, can you see my thing or still no? Either way app started just written for now. Am I too late to join, or are applications still welcomed? I'm thinking about recycling reimagining someone who never got off the ground. Come pick a fight in Gladiators! There is still time, One Who Walks With Gir Avatar. But make haste for time is running out. Name: Sir Terrance Merryweather/The Red Prince "Red"
Class Structure: A gentleman of the market by day, a vigilante by night. Terrance Terrance is a kind but cool man, his calculating nature making many find him off-putting despite his kindness. He doesn't argue with angry customers and instead will simply point toward the street and ask that the person continue upon the way to avoid any potential violence. This attitude is his driving psychological trait and has done well for him in his business, making people respect him for being a no-nonsense and fair merchant. Even if his name would not have drawn the attention of the Utopian Trade Company his shrewd business skills would and he has recently applied for membership into the Company without asking his parents to sponsor his request. Red Terrance is simply a pale facsimile of Red. Where Terrance is kind Red is generous and loving, giving a great deal of money to the local soup kitchens and toys for children. Red responds to anger and aggression with a violent outburst that is meant to bring his foe low as quickly as possible. He tries to stay out of sight when possible as he feels that when wearing his suit he is revealing his true self and he prefers that only a few see that hidden chunk of his heart. Terrance Terrance travels through the market with a distant but generally kind demeanor. He can almost always be seen flipping a small iron coin and when asked why he will answer with an aloof smile and a short story about how he was swindled on the first sale he ever made, a bag of gold that turned out to be a small layer of gold followed by iron coins. His steps match the pace of the crowd although when given his own head or when pacing at his stall he walks with the methodical steps of a tinker as an internal metronome set his perfectly even pace. The man's smell is a distinct mix of pine and sandalwood whenever the smell of the crowd doesn't overwhelm it. The feature most likely to stick into most people's mind about Terrance is his voice, a baritone growl that does not fit the usual voice of a merchant. The rhythm and inflection of his speech is very regular, bordering on monotone, and many have said that his voice would be perfect to fall asleep to but many of those same people have found themselves losing vast sums of wealth on trades that they would not have made with sharper senses. Terrance's physical appearance is not particularly imposing. He is of slightly above average height but not enough to see over the crowds. He is somewhat more heavily muscled than your average merchant but far less so than your average smith. In truth Terrance is so close to average that most people will never pay him much notice. The young man keeps a rather stylized dagger on his belt and a small blue gemstone around his neck. He keeps his facial hair in a well kept goatee while his hair is in a tight ponytail often hidden underneath a rather sloppily tied turban. His sandals make little noise on the rough-packed earth and stone that he so often walks upon and his sky blue eyes are known to pierce down to the very soul of whoever earns his gaze. Red The Red Prince is a streak of blood in the night. His red suit and armor combine to cover the entirety of his body, red spikes jutting from the armor like the thorns of a nightmareish rose. Red stalks through the streets with the grace of a panther waiting for any foe to draw his ire. The suit itself makes almost no noise although the breastplate he puts on over it does have a tendency to give a jingle on heavier steps. His fighting style is reminiscent of a tavern fighter, heavy punches mixed with rapid snap kicks to throw his foe off-balance. Red's voice averages a low tenor to high baritone with rapid fluctuations, sometimes going as high as a low soprano and as deep as a high bass. The erratic nature of his voice often discomforts his foes as it makes him appear mad, although the suit likely doesn't help this image. Terrance Terrance has been a merchant for all of his adult life, his parents encouraging him to pursue the profession but not providing him with any startup capital or goods. Since that day Terrance has built up a name for himself, although not a huge one just yet. Many people have found him to be such a reliable and trustworthy merchant that they will Celebrity Perks abilitybring him random items that they find, often times not even ask for payment. Terrance treats his small slice of fame with the same cool distance he does most things in his life and tries not to abuse the kindness of such people. His personal life has been rather uninteresting with the majority of his time spent simply resting in his small home and eating all of his meals at a local restaurant. Red In recent years The Red Prince has been spotted on the sight of many would-be tragedies, rushing into burning buildings to pull out those inside, striking down a would be murderer before they have a chance to take their victim, and a thousand other potential disasters. There is a slightly less altruistic side to The Red Prince that rumors have spoken of, stories of him breaking into facilities owned by the Utopian Trade Company and the guards posted in the area being found unconscious the following morning. These rumors have yet to be substantiated but the town guard is looking for him for both his vigilante actions and his possible connection to anti-Utopian Trade Company activity although there is, as of yet, no clear connection between The Red Prince and The Underground. both If you are looking for a story of revenge over the death of a parent or betrayal by a loved one then you have broken into the wrong man's house and are reading the wrong man's journal. My parents were aloof but not cruel, members of the Utopian Trade Guild and merchants who managed to gain a title simply for the amount of money they had amassed. They sent me to the best tutors and even splurged, upon my request, to hire a personal combat trainer who taught me the basics that I now use when I am required to defend myself. Well if you are reading this you have already managed to sneak into my sanctuary so no point in downplaying my training, its what lets me save lives and possibly uncover corruption. My alter ego was made on a whim, a whim that came about because my parents refused to answer where some of their former friends had gotten off to. One too many sudden and unexplained disappearances had me investigating homes of Utopian Trade Company members and eventually when I couldn't find any evidence of them I decided to suit up and break into UTC facilities in an attempt to uncover the truth. In my daily life I am actually attempting to join the UTC and I think my request to join the Company will be met with a confirmation as I have made a substantial profit since opening my store. Perhaps I can find out from inside the company what has been happening but I believe The Underground is more accurate than they believe. I am still attempting to find a member of The Underground who will listen to me but I fear The Red Prince suit turns most of them away... I need to continue my efforts. Last edited by MundayKnight; 03-10-2017 at 12:19 AM. I couldn't find your secret spoilerbutton Munday. Maybe you secreted that too? I dunno. So I am starting to accept people. But you still have time to apply. I am projecting another two or three weeks before the actual game starts. I will keep applications open for the next month and if someone shows up later and I need a replacement then that would be swell too. I suspect it is this post, although all I see is a spoiler button that will zap me if I touch it, MundayKnight correct me if I am wrong. It is but at this point posting character one way or the other and hope it works for ya. I don't think that would be a necessary aspect of your character. I would like to see you figure out how to work that out of your concept. Also, it prolly would zap you, ATH. But thanks for finding it for me. I have two separate write ups, no huge change either way. Just gotta have the time to sit down and type it all out as it's the week before spring break and gotta get all the students checked out for the week. He's not a complicated man, though it's not recommended to take him for a fool. He says what he means, often putting his thoughts coarsely just as thinks them. He is uneasily impressed and far too serious for anyone's own good, often missing the joke. He loves books, connecting more to the brilliance of the long dead than the humanity of those around him. He is also something of an over preparer, often concocting plans more advanced than needed, bring more books than time allows, practicing rarely used talents, and brings enough gear to for a great many situations- just in case. He makes it a point to be professional, even when he is not on the job. He can be silent for hours at a time, feeling little need to engage in idle chit chat; however, when it is time to plan a strategy or discuss martial techniques, it can be hard to shut him up. He is also a kind man to those he considers good. His strong desire to protect the weak, and general work ethic as a body guard would be apparent, even if he did not point them out periodically. Beyond that, he's a bit of a loner. He only has one true friend. He keeps business separate from pleasure, and rarely engages in pleasure for pleasure's sake. He does love to read and discuss martial strategies. He does not look like a body guard or a bookworm. He stands just over 6' on a lanky frame, always glad in green and brown armor.There is a four inch scar running from his right temple to his jaw. He's not muscular or big, simply long armed with trimmed muscle with pale green eyes that show he is serious.Those eyes also show a hidden sadness somewhere deep within. When working, his face behind a black mask, and has a short fat sword around his hip. The few years have been relatively uneventful. Inconsistent work, no love interests, and the same routines. He's a bodyguard, but a principled one. It can be hard to find this kind of work with principles, because most of these jobs require pretending you don't have any. He has one friend, Johnar (background), whom he regularly meets for a pint or sparing. They used to regularly work together, but the jobs seem fewer and fewer these days. He is not married and has no children. In fact, he has not known the touch of a woman in a few years now. His home is little more than sticks covered in thick clay with a straw roof, a single table, and a bed. He trains everyday and reads by night; things he will tell you enrich his life and might save yours. His last job has lasted for two weeks, but it's guarding a pile of junk no one would want. But, he does get to work with an interesting sun elf who has things to say that are worth hearing. It's been some time since he connected with someone intellectually- which can be hard for the super intelligent as well as the uneasily entertained. The last day was yesterday, and they know where one another live and drink. Who knows, perhaps they'll start swapping books, jobs, and stories. He was born the son of a merchant who had build himself up and a miserable but beautiful alcoholic. His father was a simple man: he worked and he tended to his family. His mother was a complicated woman: never quite pleased within anything, including son, her husband, or herself. These people taught him the value of work and kindness. His mother was the one to put a sword (and a drink) in his hand at a young age. 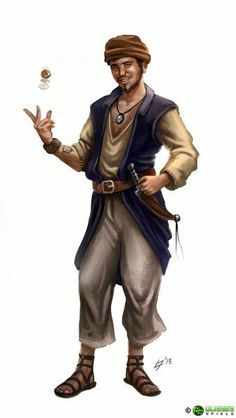 Dervish defender are proficient in all simple weapons and martial melee weapons, double weapons, and with light armor. They are not proficient with shields. ManeuversThe dervish defender gains access to Thrashing Dragon and loses access to Iron Tortoise. Bluff is no longer a class skill; Acrobatics is now a class skill. New Disciplines: A warder with the dervish defender archetype adds either Eternal Guardian or Riven Hourglass to her list of available disciplines. If she does not have that discipline’s associated skill as a class skill, she gains it as a class skill. This alters a warder's maneuvers, and replaces a warder's standard new disciplines. The dervish defender gains Two-Weapon Fighting as a bonus feat at 1st level. While not all dervish defenders fight in the same manner, most do and all are extensively trained in these fighting philosophies. While wearing light armor or no armor, wielding a weapon in each hand (or using a double weapon), and not using a shield heavier than a buckler, the warder may add her Intelligence bonus (if any) to her Armor Class. She retains this bonus even against touch attacks or when flat-footed, but loses this bonus should she be rendered helpless by any means. A dervish defender is capable of an aggressive defense, attacking even as they defend. At 4th level, the dervish defender may use a counter against an enemy's attack and if she successfully counters it, she may make an immediate attack of opportunity against that foe. This ability replaces the tactical acumen class feature. At 6th level, when fighting unarmed or with a weapon from the light blades, double weapon or close weapon weapon group in each hand, the dervish defender improves her shield bonus to AC by an amount equal to her aegis bonus. As an immediate action, the dervish defender may lose her shield bonus to armor class until the beginning of her next turn and grant an adjacent creature an equivalent shield bonus to armor class until the beginning of the dervish defender's next turn. This ability replaces the clad in steel class feature. Last edited by SwiftBlade; 03-11-2017 at 08:06 PM.